May 6, 2016 – Montreal, Quebec – Critical Elements Corporation (“Critical Elements” or the “Company”) (TSX-V: CRE) (US OTCQX: CRECF) (FSE: F12) is pleased to announce that Platypus Minerals Ltd (ASX:PLP) (“Platypus”) completed its due diligence over the Lemare lithium project in Quebec, Canada, and has directed Lepidico Ltd (“Lepidico”) to proceed with exercise of the Lemare Option. 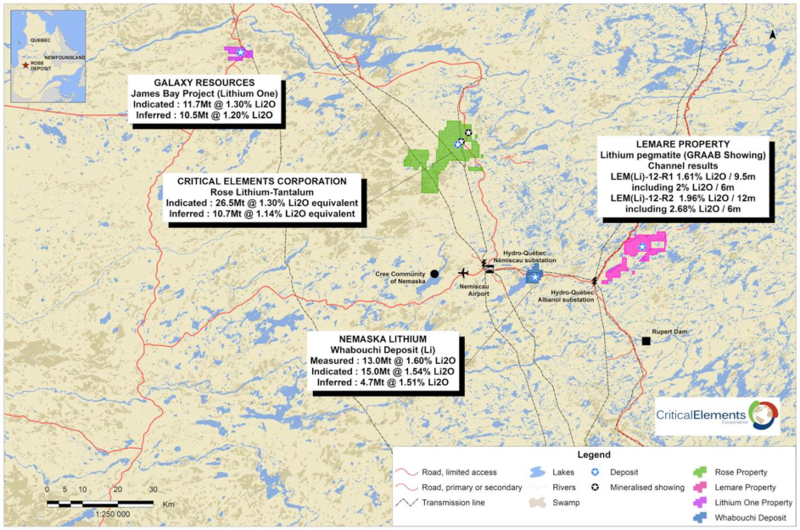 The Lemare lithium project is located in the James Bay region of Quebec, Canada and is prospective for pegmatite-hosted lithium mineralisation (Figure 1). The project is secured by an option agreement (“Lemare Option”) entered into the Company and Lepidico on February 11, 2016 (see press release dated February 11, 2016). Platypus and Lepidico have signed a Share Sale Agreement (“SSA”) under which Platypus is to acquire 100% of the issued shares in Lepidico. The transaction is to be voted on by Platypus shareholders in general meeting to be held on May 30, 2016. Under the terms of the SSA, Platypus was to undertake due diligence on Lemare by May 11, 2016 and, if satisfactory, could direct Lepidico to exercise the Lemare Option. Consequent on that direction, Lepidico has accordingly advised Critical Elements. Figure 1. Location of known lithium deposits and occurrences in the James Bay area of Quebec (according to Quebec Ministry of Natural Resources and Fauna, 2011). 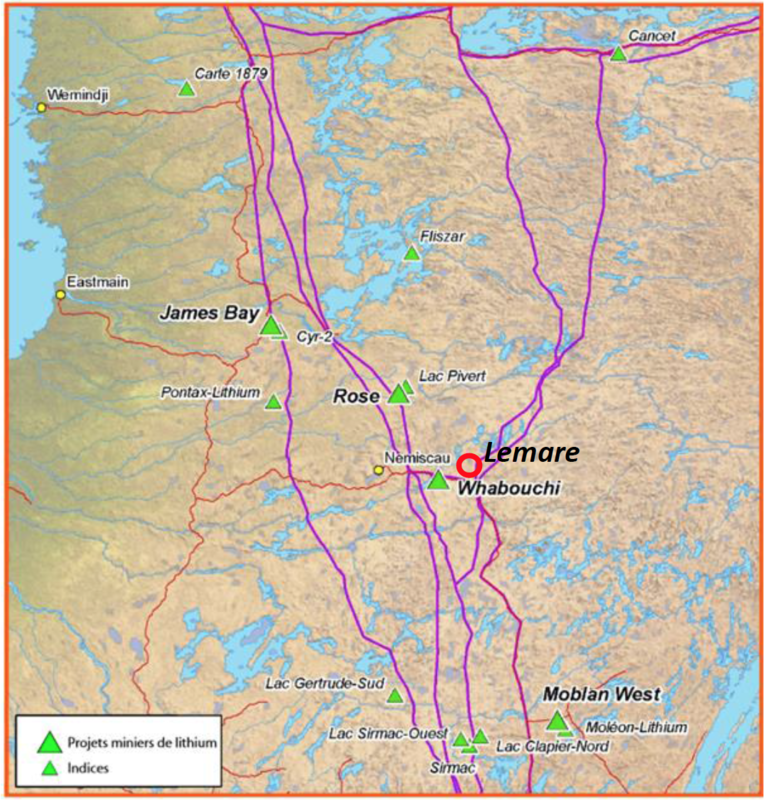 The Lemare project covers approximately 70 km2 of tenure in a proven lithium district that hosts several advanced lithium deposits in the vicinity of Lemare (Figure 2). 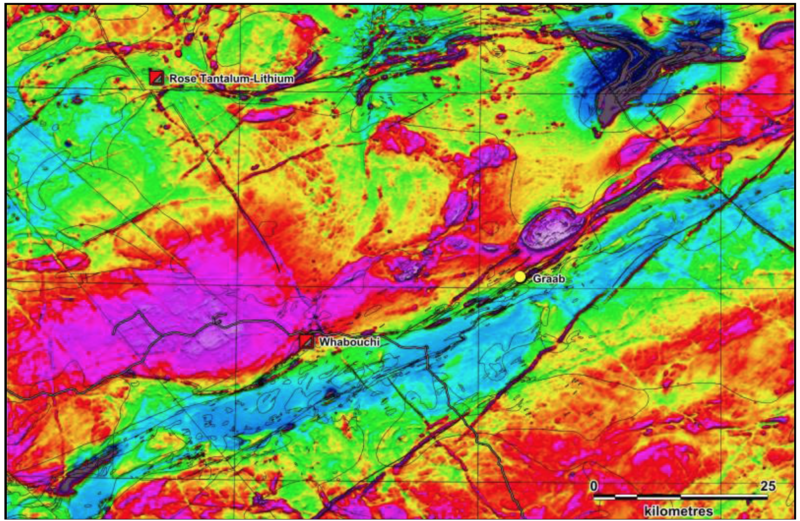 The project contains an undrilled spodumene pegmatite discovered in 2012 (initially labelled as the “Graab Showing”) at least 200 m long and grading up to 12 m @ 1.96% LI2O, including 6 m @ 2.68% LI2O, as defined by surface channel sampling. No subsequent work has been conducted at this prospect. Figure 2. 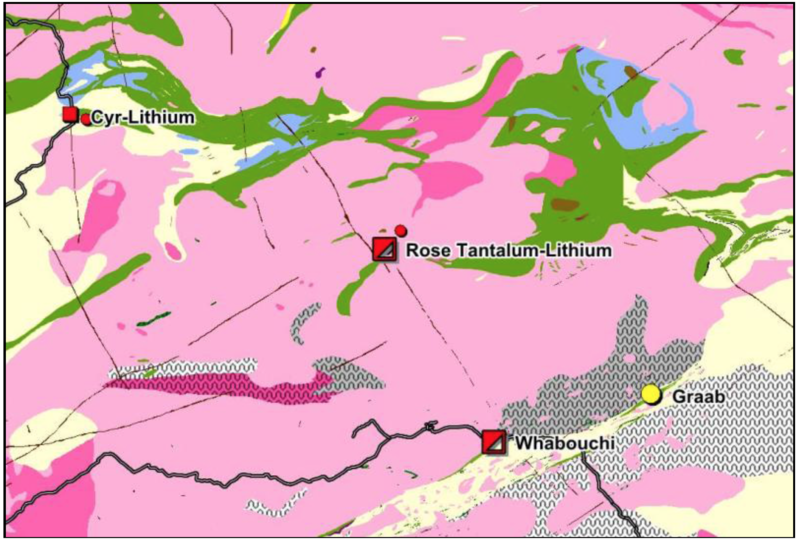 Advanced lithium deposits and location of the Lemare project claims (deep pink) in the James Bay area, Quebec, Canada. While a site visit was precluded by unseasonable snow, investigations by Platypus and discussions with independent geological consultants in Montreal have supported the prospectivity of the Lemare property for lithium mineralisation. The Lemare pegmatite (or, Graab showing) was fortuitously discovered in 2012 during the course of nickel-gold exploration within a metamorphosed greenstone sequence. The identification of a lithium-bearing pegmatite in a district known to host other lithium deposits defined by multiple pegmatite occurrences suggests that there is good reason to expect additional pegmatites to be present in the Lemare area. In addition, Lemare is located only some 25 km east-northeast of the Whabouchi deposit (Figure 2), held by Nemaska Lithium, within a similar geological setting, namely, on the margin of a belt of metamorphosed greenstones fringing a zone of granulite and migmatite rocks (Figures 3 and 4). This setting bodes well for the potential discovery of additional occurrences of pegmatites in favourable structural locations. Under agreed terms, on exercise of the Lemare Option, Lepidico is to pay Critical Elements $35,000 by May 10, 2016 and a further $35,000 by September 9, 2016. In addition, $800,000 is to be expended by Lepidico on exploration at Lemare by December 31, 2016. Under the terms of the SSA with Lepidico, and pending shareholder approval at the general meeting on May 30, 2016, Platypus will issue to Critical Elements $500,000 worth of Platypus shares at an issue price determined by the 5 day volume-weighted average price following the general meeting. It is intended that exploration, including drilling of the Lemare pegmatite, will commence in mid-July 2016. Budgeting of an exploration program in consultation with Critical Elements is presently underway, with work to comprise an initial 2-3 week mapping/orientation program, followed by drilling (2,000 m – 3,000 m) with an aim to define an Inferred Resource at Lemare by December 31, 2016. Figure 3. Summary geology of a portion of the James Bay region, Quebec, Canada, showing similarity of geological setting of Whabouchi and Lemare on the northern edge of a belt of metamorphosed greenstones (green and yellow) wrapping around a zone of high-grade granulite and migmatite (dark grey). (According to Quebec Ministry of Energy and Natural Resources, 2016). Figure 4. Geophysical image (magnetics) of a portion of the James Bay region, Quebec, Canada, showing position of Whabouchi and Lemare in zones of dilation within a mobile belt fringing a rigid body. (According to Quebec Ministry of Energy and Natural Resources, 2016). Lepidico is a lithium company with interests in lithium exploration assets and processing technology. It’s current exploration assets include an option over the Lemare project in Canada; ownership of the Euriowie project near Broken Hill in New South Wales; and a memorandum of understanding on a strategic 50:50 joint venture with ASX-listed Crusader Resources (ASX:CAS) to jointly exploit lithium opportunities in Brazil, including Crusader’s Manga prospect. Lepidico also owns the L-Max® technology, a metallurgical process that extracts lithium from non-conventional sources, specifically Li-rich mica minerals such as lepidolite and zinnwaldite. Lepidico’s largest shareholders are Strategic Metallurgy Pty Ltd and Potash West Ltd (ASX:PWN). Platypus Minerals Ltd (ASX:PLP) is a Perth-based company that is dedicated to the exploration and development of mineral projects prospective for copper, gold and other strategic metals including lithium in both Australia and in stable jurisdictions overseas. The focus is on projects that exhibit proven mineralisation, are under-explored, and have the potential to generate large economic deposits and deliver returns to shareholders. In late 2015 Platypus announced its intention to focus on its current assets in the Pearl Bar-Gobbos area whilst also initiating an entry into the lithium sector, and since then has been seeKing and screening potential lithium opportunities globally, culminating in an agreement of terms on March 15, 2015 to acquire 100% of Lepidico.